We have opened and can't be more excited to share this special condo. This is the sister condo of The Lucky Coconut. Same complex to view #488740. Book with family and friends. This is one of the very few condos at Pohailani with a view of the ocean in the distance. Check out our reviews of The Lucky Coconut VRBO #488740 if you are travelling with a group.......family or friends stay at the same complex and coordinate with one owner only. Make your travelling plans simple so you have more time to relax! Thank you for considering Ka Laki Mango- The Lucky Mango! We hope you enjoy this coastal glam beach style condo as much as our family does, it is a real little gem and a perfect place to stay for your vacation! This is a sister property to The Lucky Coconut ( property #488740). We decided due to popular demand to open a second condo within the same complex. We are so very excited to have two beautiful condos to share with our guests. Please have a look at our reviews and condo decor of The Lucky Coconut to see the quality work and service we provide to all our guests. So if you are travelling with family or friends check out both of our condos. Our remodel of The Lucky Mango is a coastal beach feel which reflects our passion for sunny days at the beach, relaxation and the enjoyment of water activities. The condo has vaulted ceiling which provides a spacious and coastal feel. 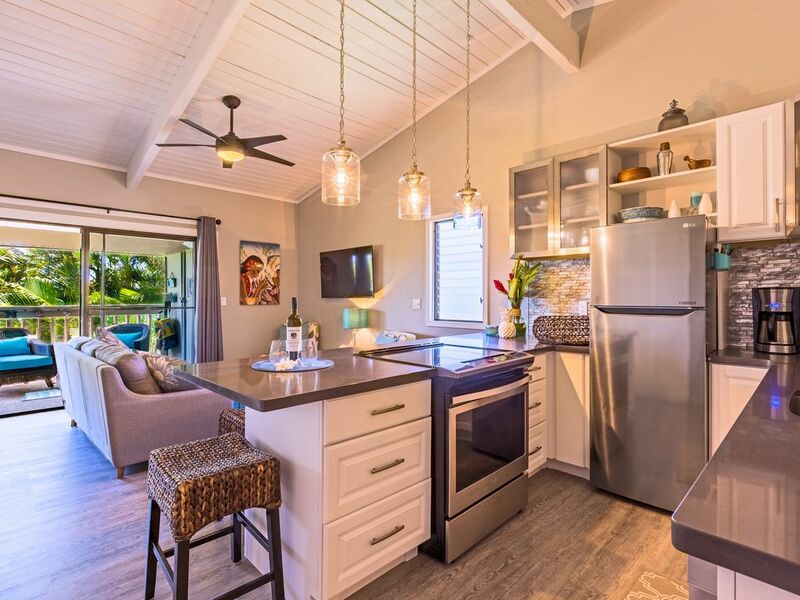 The Lucky Mango is located in Kahana and situated on 9 lush tropical acres with 2 pools, basketball and tennis court, 3 barbecue areas - one directly located on oceanfront. This area also provides a wonderful place to enjoy a coffee or glass of wine while watching the sea turtles and humpback whales. Loungers and picnic tables are provided in this area for your comfort. Just North of the property is Napili bay, it is one of the best places on the island to snorkel and swim. Kahana beach is a short 3-5 minute walk just south of the property where you will find a nice uncrowned beach, good for children. This 2 bedroom, 1 bath unit with a large Lanai that overs looks the beautiful gardens, pool and a very small sneak peek of the ocean in the distance. The condo will sleep 4 guests comfortably. ( we also provide a blow up bed if you have an e tea child) The entire condo has been freshly painted and nicely decorated. There is Luxury vinyl flooring in the living area, bedrooms and kitchen. The bathroom has tile flooring, nice and cool on feet on those warm Maui days. The kitchen is equipped with all new Whirlpool appliances including a ice maker in the fridge and a full size oven. The breakfast bar offers additional counter space and seating for 4. The first bedroom has two twin beds with the option of a blowup bed (good for 3rd children if needed). The second bedroom has a queen bed and a large window that faces into the garden. All beds are hotel quality with pillow top mattresses for your ultimate comfort. Cotton sheets to keep you cool along with ceiling fans throughout. The living room has a quality Sofa and a 50 inch flat screen on wall for your entertainment. A Bose Sound link Bluetooth speaker for you to enjoy listening to music. (please do not remove the system from the condo, it is not meant for outside use and we want to ensure all of our guests have the opportunity to enjoy..... Mahalo) The large covered lanai has seating for 6 with a wooden farm house table and 4 dining chairs and two loungers for your comfort. This condo is on the top floor, approx 10 steps to climb. The lanai gives you a beautiful view of the grounds, part of the pool and a very tiny peek of the ocean in the far distance. The lanai is a wonderful place to watch the sunset. The Lucky Mango is just a short drive to world class golf courses, hiking trails and the Historic town of Lahaina. We hope you enjoy The Lucky Mango our second oasis as much as we do! We are very pleased with our recent reno and we will continue to make updates on a routine basis to ensure our condo is comfortable and looks great for all guests to enjoy! Kahana is centrally located between the resorts of Kaanapali and Kapalua on Maui's beautiful west side. Pohailani is ideally located offering a perfect blend of resort amenities along with a relaxing oasis feel. The complex is tucked away in tropical large foilage, offering a slower pace that vacationers come to Maui for......it's a perfect location. The weather is some of the nicest on the island . Close to us is Honolua and Napili Bay, one of the best beaches for snorkelling. *Once you have booked The Lucky Mango I will provide you with additional information about shopping, restaurants, and activities. I am reachable at anytime and I am happy to answer any questions that you may have in order to make your stay in Maui as wonderful as possible. Pohailani complex is absolutely lovely. This is our second condo, we purchased The Mango after enjoying our first condo The Lucky Coconut since 2013. The location could not be better. It is largely residential area, and it was important to us to have a home like feel to our property and we liked the appearance of the 2 storey complex, the gardens are lush and tropical with lots of green space for our child to play. It is directly across the street from the ocean, where we can sit and relax while we Whale watch or simple watch the Sunset. The condo is close to amenities and walking distance to the beach, all in all it is perfect location to own an oasis. The condo remodel is completed however we continue to make small changes . As promised this oasis is absolutely stunning! Simliar to our first unit The Lucky Coconut, we are so pleased with the reno. This condo has a coastal beach feel and we were inspired by the time we have spent at Pohailani and surrounding beaches over the last few years. Our new condo is fully stocked with all the little extras to make your vacation special! Nestled in a quiet complex, 5 minute drive south to amazing restaurants, golf courses and the famous historic town of Lahaina. Not to mention you simply have to walk across the street and 2-3 minutes south and you are enjoying Kahana beach. Lovely quiet beach with amazing sunsets and some surf if you enjoy boogie boarding. This is the perfect location for a relaxing getaway! So if you are travelling with family and friends and need two condos I will be able to accommodate you! Spa like bathroom, brand new soaker tub with tile walls and a shower. Bamboo vanity and ceiling fan for your comfort. One of the few condos at Pohailani that has an ocean view in distance from the lanai, master bedroom, livingroom and kitchen. Complex is oceanfront, with units on both water and garden side. Our Unit is on the garden side approx. 150 steps from the seawall where you can view the Maui sunsets, watch the whales and turtles. Ocean view in distance from lanai. One of the few properties on the garden side with this spectacular view, it is simply amazing! AC in both bedrooms for guest comfort. Hotel quality lines and towels. Plus 1 beach towel per guest provided. Laundry facilities are located at the Community centre for your convenience. Coin operated. Please use pool key to access. Stocked with a change machine and laundry detergent for purchase. Parking directly next to condo, room for two smaller vehicles or one large vehicle. Stall #19 No additional charge for parking! Each booking we provide a starter pack of essentials. The internet information will be provided to guests upon arrival. Brand new sofa with two complimentary armless chairs. Enough seating for 5 guests. Slide in stainless Whirlpool stove. Brand new stainless steel appliances. Fully stocked kitchen, including a blender, rice cooker, slow cooker BBQ utensils ect. Farm table on Lanai, seats 4 guests comfortably. 2 Smart Tv's. One in the first bedroom the other in the livingroom. However can be seen from Master bedroom. Google mini for your entertainment pleasure. You can play music, games or ask questions about weather and restaurants. To start simply say “hey google” ......what time is it? Just as an example. We have a selection of books for guest use please leave for other guess to enjoy. As well at the community centre there is a book exchange open to all guests. Condo complex has an activities room with a reading space for kids, games and books to borrow. Condo is located on 9 acres of green space. The grounds are lush and beautiful. You can find varies fruit trees including coconut, bananas, mangos, and star fruit on the property. Our lanai, overlooks the big pool, lush gardens and one of the few condos in the complex that had an ocean view in the distance. It is simply amazing. 2 Boogie boards for guest use. Our equipment is replaced twice a year so please take care of it if you use so it will be in good working condition for next guests to enjoy. Located close to several world class golf courses. Families, couples and children big or small. 2 pools on complex. One smaller pool and one large pool. Condo is approximately 50 steps from large pool. ***No smoking in condo, Lanai or on property. This condo was beautiful, every little detail made it feel like home. Beds were comfy, condo was clean, very well equipped with everything you would need. Loved the location, close to most places so a great place to base yourself when exploring Maui. The hosts were great to deal with & gave us great info on the area. Very nice place! Very clean and had everything we needed! Would come back! We really enjoyed our stay at the Lucky Mango. It was very neat and clean and had everything we could have needed including boogie boards and beach gear. We appreciated all the little things the condo had to offer, and loved sitting out on the lanai listening to the birds and looking out at the palm trees. Thank-you for a wonderful stay. Wow.......... mahalo for the fantastic review! The Lucky Mango it truly a little piece of paradise. Our favorit part of the condo is the lanai it is so peaceful and the ocean view in the distance is so amazing. We are so pleased you enjoyed The the little extras and al, the beach gear we supply. We try to make your vacation as worry free and relaxing as possible so you have can focus on having a wonderful holiday. We hope you come back and stay with us again soon. This was our family's 4th trip to Maui and our first time staying at The Lucky Mango as a family of four. It was everything we were looking for in a home away from home. Clean, bright, comfortable and all the amenities we would ever need for at the condo and at the beach. During our stay, Maui experienced a few days of very unusual cold and wet temperatures and we were so grateful to have a home that we felt cozy and comfortable in when having to spend time indoors. I highly recommend the Lucky Mango! So pleased you had a family wonderful vacation to Maui. We are so pleased to share our little piece of paradise with families such as your. We try to make sure that we do not leave any detail out and stock the condo exceptional well so you have a comfortable and stress free vacation. We hope you come back soon and stay with us again. Mahalo for your kind words. Great location, tidy and clean! Communication with host was excellent and timely. We would stay here again! We are so pleased you enjoyed your stay our goal is to make it as simple and wonderful for guests who choose to book The Lucky Mango or our sister property The Lucky Coconut. Look forward to hosting you again. We had such a lovely time! Melody has decorated her condo thoughtfully and beautifully, and was welcoming and accommodating. The location was perfect, with a great beach just steps away. We had everything we needed and appreciated all of the suggestions on where to go and what to do. Mahalo! Mahalo for the kind words. We agree The Lucky Mango is beautiful and tranquil. We try to provide accommodation that we ourselves would enjoy and we take it one step further by providing you with travel information and recommendations to make your vacation memorable and simple. Please come back and stay with us again and please let your family and friends know about this hidden gem! The area of Kahana is centrally located between the resorts of Kaanapali and Kapalua on Maui's beautiful west side. Pohailani is ideally located offering a perfect blend of resort amenities along with a relaxing oasis feel. The complex is tucked away in tropical lush foilage, offering a slower pace that vacationers often come to Hawaii for......it's a perfect location! The weather is lovely all year round. Honolua and Napili Bay which are absolutely breath taking and is just a short distance from our condo. Napili bay is one of the best beaches on the west side to go snorkling on the island. The area boasts access to great restaurants, pubs, and shopping. If you are looking for a localized flavor or whether your plans take you on The Road to Hana, or to the top of Haleakala (our island's largest dormant volcano), to the North Shore, or to South Maui ... you will find our condo in Kahana a welcome and wonderful place to return home at the end of the day......this is the perfect place to call home for your next vacation!